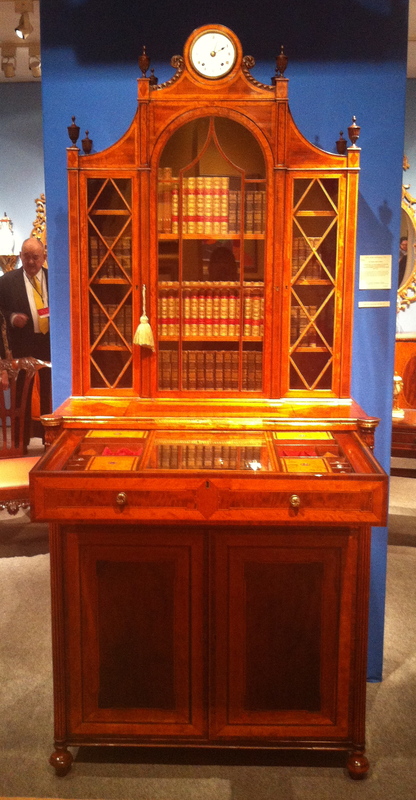 Once again January rolls around, and I find myself at the Winter Antiques Show in New York City. It is one of America’s premier antiques shows, and it provides curators, established collectors, dealers, design professionals, and first-time buyers with opportunities to view, learn about, and purchase lovely pieces showcased by the exhibitors. For me, on a cold day in January, I can’t think of a better place to be with one of my dearest friends. This year I went with the intention of purchasing another miniature portrait to add to my collection. Unfortunately, I didn’t see any that caught my eye. I did, however, see a few items that were beautiful, intriguing, and/or just plain fun. It wasn’t until I began looking through my photographs that I discovered I’d been given a glimpse into the life of a Regency era gentleman. Let me show you what I mean. 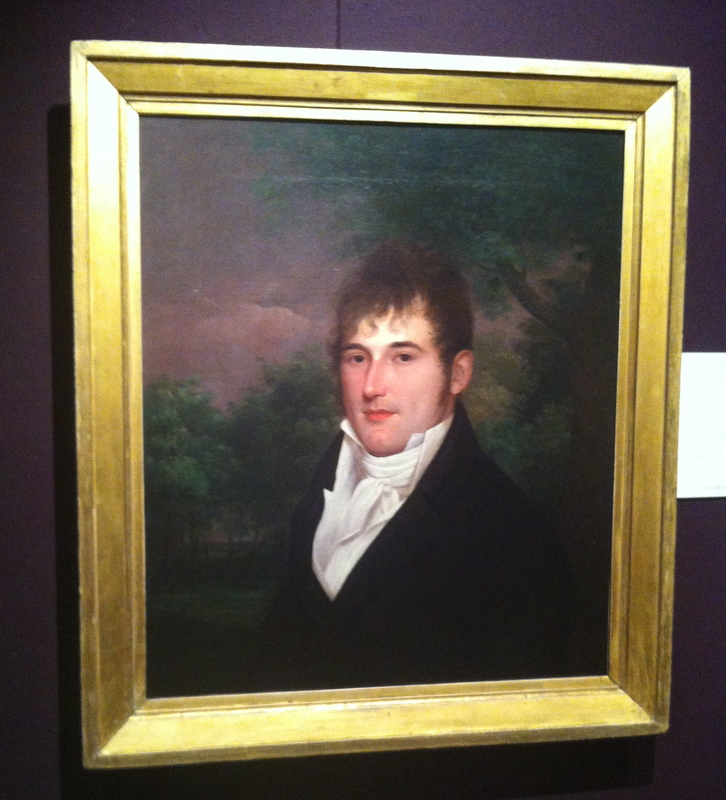 The first portrait that caught my eye, was of this handsome gentleman showcased by Schwarz Gallery. This portrait was painted in 1810 by the renown American artist, James Peale (1749-1831). The sitter is Mr. Anthony Groves, who was a prominent Philadelphia merchant. One of the things I like best about this portrait, is the charming dimple Mr. Groves sports on his left cheek. 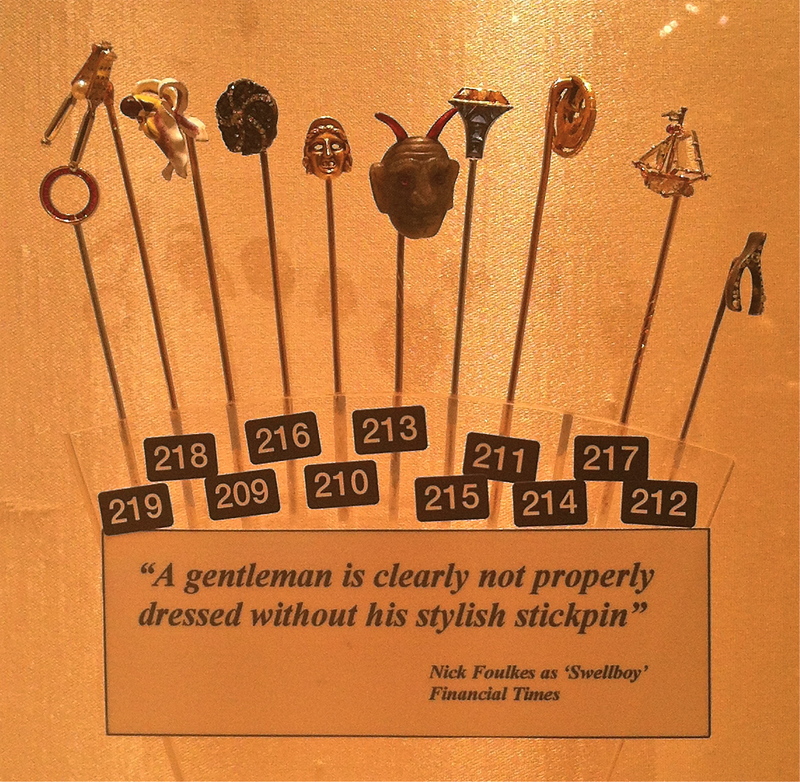 On the lookout for stunning pieces of jewelry, we stopped by Wartski’s exhibit and saw this selection of stylish stickpins to adorn a man’s cravat. Over at Hyde Park Antiques, where I could easily live if they’d let me, I found this rare Thomas Weeks Cabinet. It is a George III stainwood and mahogany secretaire bookcase attributed to George Simpson for Thomas Weeks c.1805. The best part of this piece, to me, was discovering a complete men’s dressing drawer above the fold out desk. Those stickpins would fit quite nicely into that drawer. I liked this piece so much, that I plan to devote an entire blog post to it in the coming weeks. And what novel would be a wonderful addition to that bookcase? I think the first edition of Jane Austen’s Emma would fit nicely behind those glass doors. Emma was the last novel Jane Austen published in her lifetime. It was first printed in 1816 in London as a three-volume set. This set is offered by Bauman Rare Books. Perhaps a gentleman might store the volumes inside his bookcase for his wife. If you read or write books about Regency era spies, you might find this piece fun. 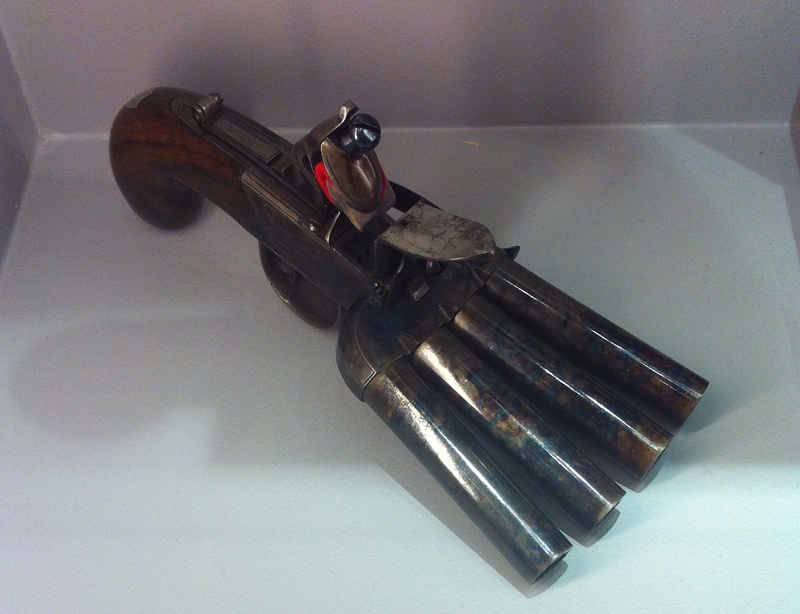 It is an English four-barrelled flintlock “Duck’s Foot” type volley pistol, by Lea of Mansfield. It was made around 1810 and is showcased by Peter Finer. And after a long day of spying, a gentleman might just need a drink. 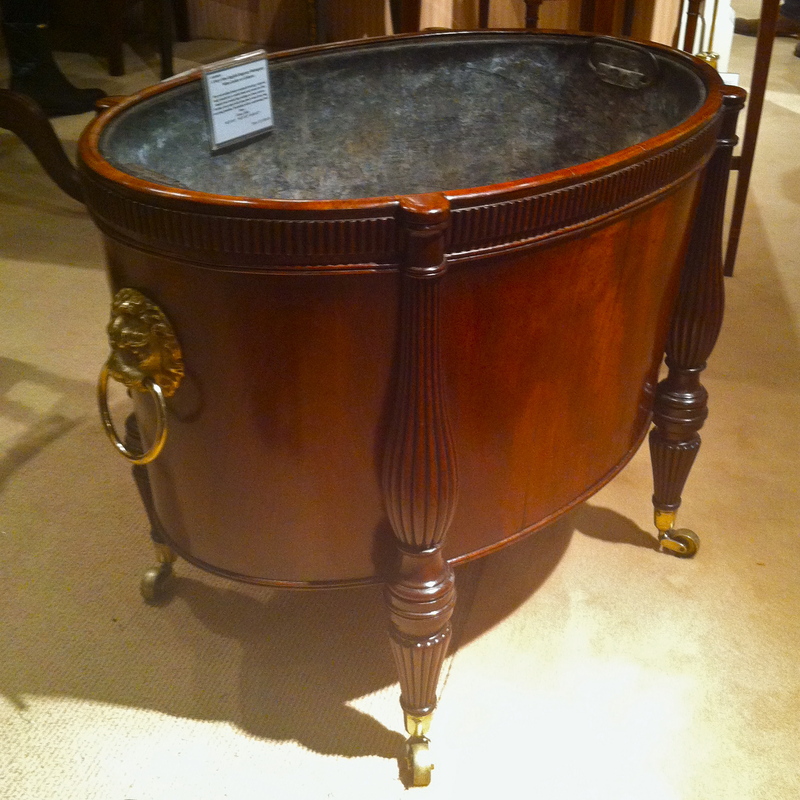 This is a very fine English Regency wine cooler or cellaret made of mahogany (c.1810) from Georgian Manor Antiques. If he’d like to enjoy his drink by candlelight, a gentleman could have used this gilt bronze and marble casolette (ca.1815) to hold his candle. 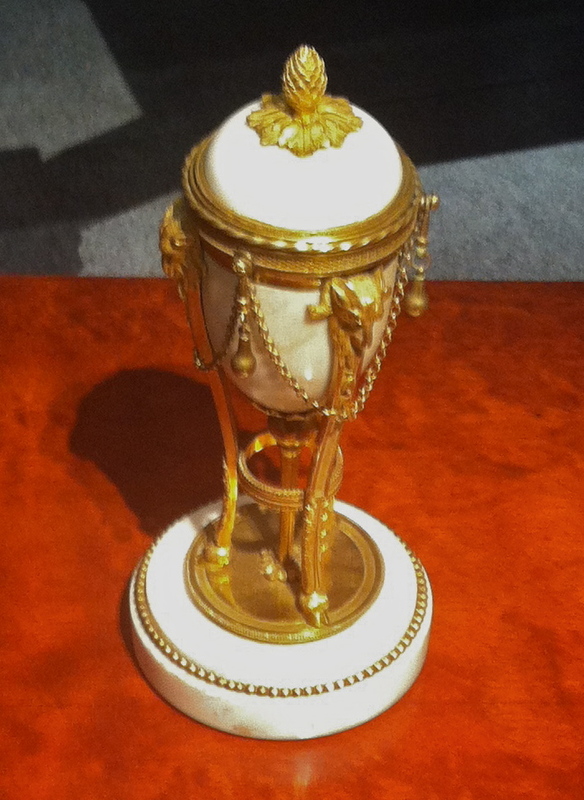 This piece was also showcased by Hyde Park Antiques. The top portion flips over, revealing a candleholder that rests back into the base. 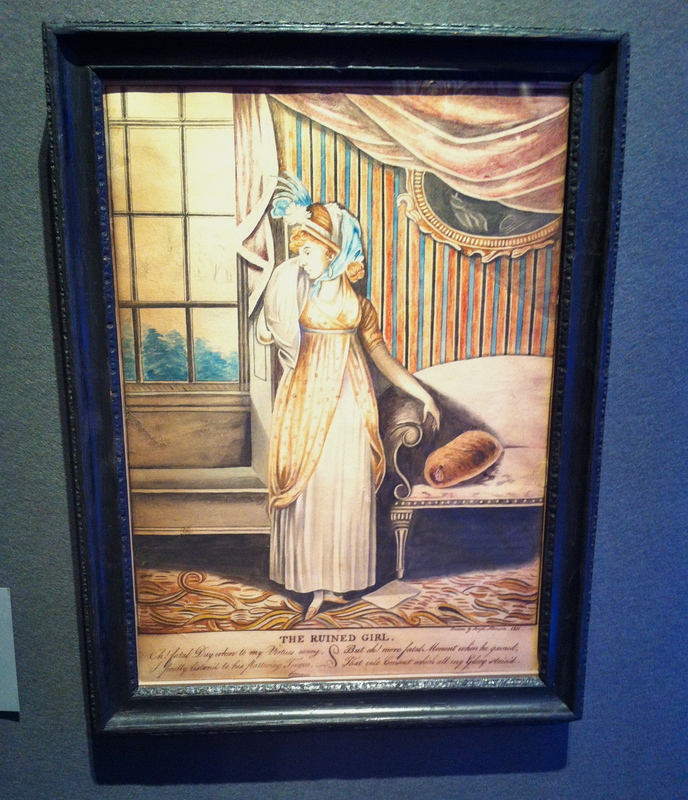 I hope you enjoyed taking a short tour of the Winter Antiques Show with me and getting a peek at some of the objects that a Regency era gentleman might have used. I’d love to know which one is your favorite. I think the Regency wine cooler is my favorite. Although Thomas Weeks Cabinet is a tough one not to choose. Glad you enjoyed your annual trip to the antiques show. Thanks for sharing. The wine cooler caught my eye, and it made me wonder what kind of evening entertainments it witnessed. Thanks for stopping by my cozy corner of the world. I write books set in the early 19th century and love researching that time period. If you’ve read any of my books, you can search the titles and the research related to that story will pop up. Otherwise, just click on the areas I’m interested in to see some of my past posts. I don’t post on a regular basis, just when I find interesting information to share. So if you don’t want to miss future articles, please click the button blow to subscribe to my blog. Enter your email address and click to be notified of new blog posts via email. ©Laurie Benson, 2019. Unauthorized use and/or duplication of this material without the express and written permission from this blog’s author and/or owner is strictly prohibited. Excerpts and links may be used, provided they give full and clear credit to Laurie Benson with appropriate and specific directions to the original content.